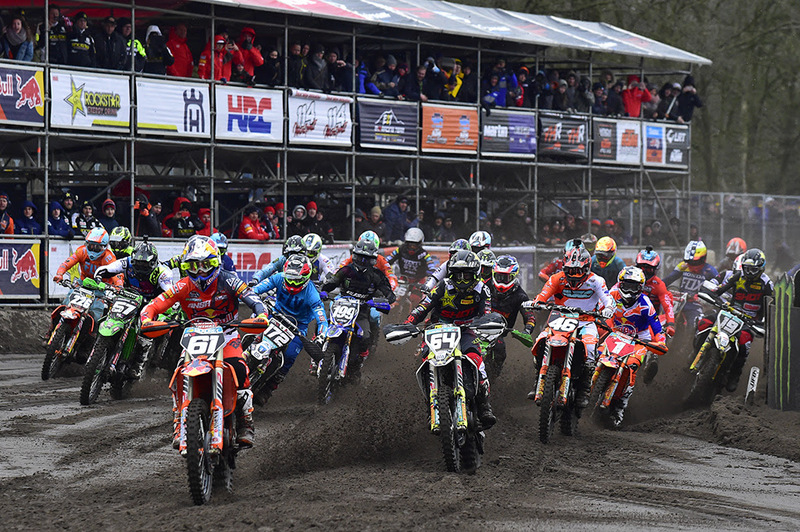 The first day of the MXGP of Europe has wrapped up in Valkenswaard, the Netherlands where MXGP, MX2 along with EMX300 and EMX125 both presented by FMF Racing took to the demanding Dutch Circuit. Tricky conditions combined with cool temperatures would lead to a memorable day of racing. Heating up with their first pole positions of 2018 were Monster Energy Yamaha Factory MXGP’s Jeremy Van Horebeek and Rockstar Energy Husqvarna Factory Racing’s Thomas Covington in MXGP and MX2 respectively. 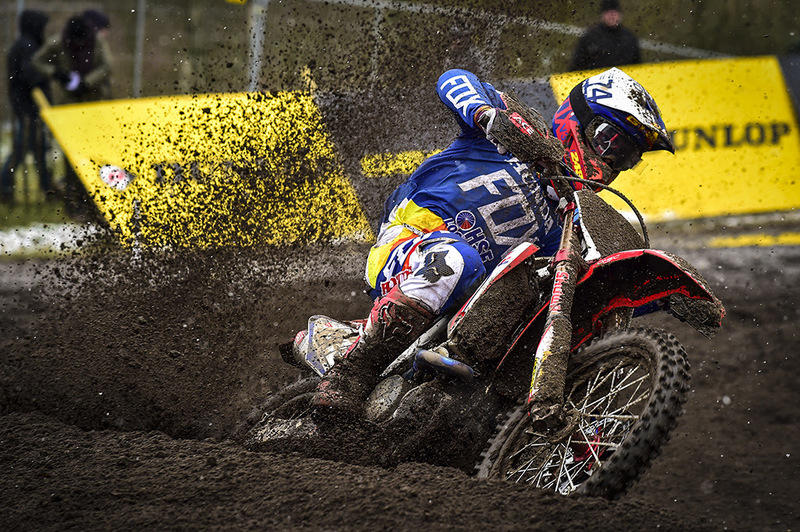 Alongside the MXGP and MX2 stars were the first round of the European Championships of EMX125 and EMX300 both Presented by FMF Racing. The group of 300cc racers was composed of both former champions and upcoming stars. 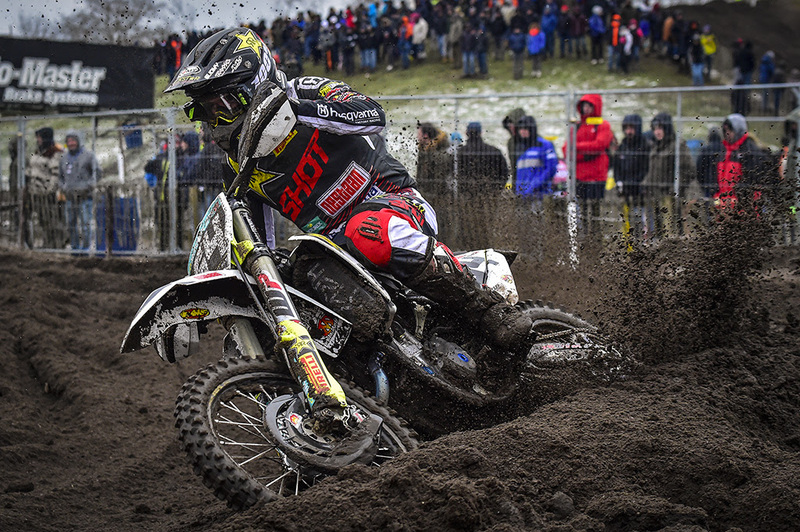 Last year’s title competitors, Brad Anderson and Mike Kras, again found themselves at the front of the field but the young Belgian Greg Smets would take the lead from Kras early on his way to his first ever European Championship Race win as Kras and Anderson took 2nd and 3rd. 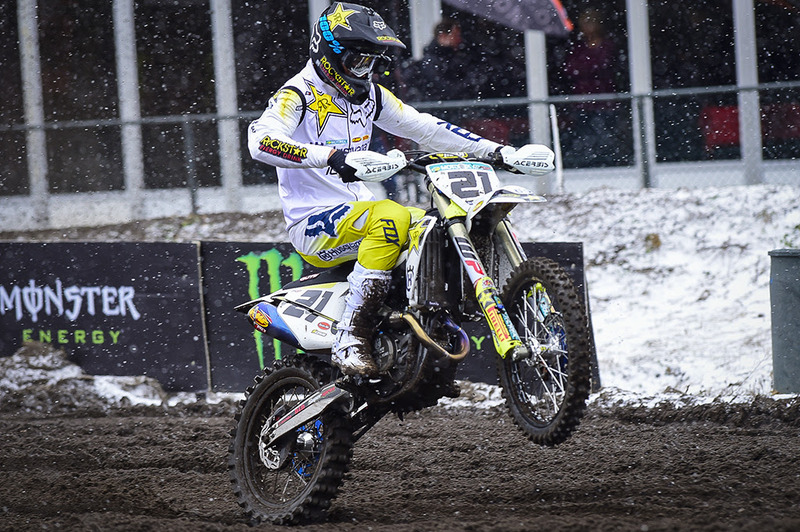 In EMX125 class former 85cc Junior Motocross World Champion Rene Hofer also took his first European Championship race win against a field of more than 80 riders at the start of the day including Emil Weckman and Mario Lucas Sanz in 2nd and 3rd. Off of the start of MXGP Qualifying Race Monster Energy Yamaha Factory Racing MXGP’s Jeremy Van Horebeek took the Holeshot but Dutch sand master, Red Bull KTM Factory Racing’s Jeffrey Herlings, passed the #89 almost immediately. 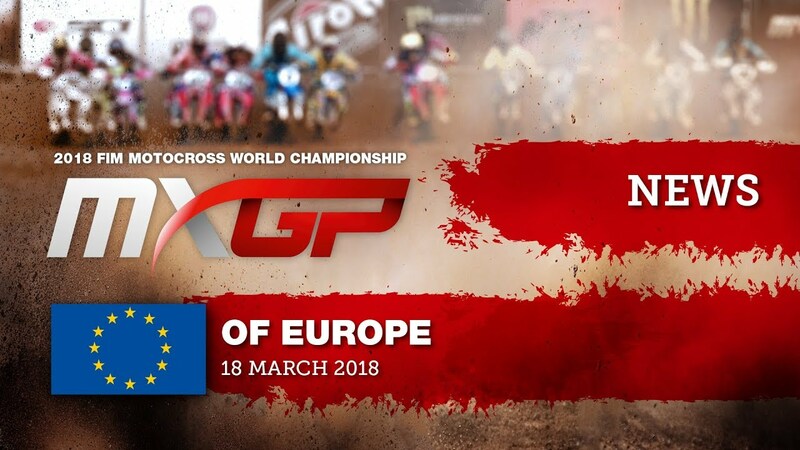 Behind Herlings and Van Horebeek was last year’s MXGP of Europe overall winner, Rockstar Energy Husqvarna Factory Racing’s Gautier Paulin and 2016 MXGP World Champion, Team HRC’s Tim Gajser. Gajser who is returning from an injury suffered only one month ago showed he wasn’t phased by the pressure or the conditions. First to press onto the back wheel of Gajser was Wilvo Yamaha Official MXGP’s Shaun Simpson, however near crash and impressive save by Simpson allowed Gajser some space to breath. Though it was not long before Red Bull KTM Factory Racing’s Antonio Cairoli slid past a rattled Simpson and closed on the Slovenian. Simpson would later make a mistake which could not be saved and so too did Monster Energy Yamaha Factory Racing MXGP’s Romain Febvre. However the most notable crash and mistake was the one of Jeffrey Herlings while leading. The #84 tucked the front wheel on the landing of a double resulting in a crash. Herlings once going again, pulled into Pit Lane convinced that he had broken his front wheel. As the mechanics of Herlings rushed to swap out the wheel Van Horebeek led. The other Dutch Red Bull KTM Factory Racing rider, Glenn Coldenhoff worked his way into 5th after passing Wilvo Yamaha Official MXGP Team’s Jeremy Seewer. In the end Jeremy Van Horebeek took the Qualifying win ahead of Paulin, Gajser, Cairoli, and Coldenhoff while Herlings, who rejoined the race in 35th, qualified 19th. MXGP Qualifying Race Top Ten: 1. Jeremy Van Horebeek (BEL, Yamaha), 24:48.416; 2. Gautier Paulin (FRA, Husqvarna), +0:07.244; 3. Tim Gajser (SLO, Honda), +0:11.955; 4. Antonio Cairoli (ITA, KTM), +0:18.301; 5. Glenn Coldenhoff (NED, KTM), +0:19.235; 6. Jeremy Seewer (SUI, Yamaha), +0:26.564; 7. Clement Desalle (BEL, Kawasaki), +0:33.880; 8. Evgeny Bobryshev (RUS, Suzuki), +0:40.318; 9. Tommy Searle (GBR, Kawasaki), +0:42.546; 10. Maximilian Nagl (GER, TM), +0:42.812. The MX2 Qualification Racing at Valkenswaard was just as demanding and surprising as that of the MXGP class. At the start of MX2 Qualifying Race Red Bull KTM Factory Racing’s Jorge Prado flew off of the grid to a substantial Holeshot. Pursuing the #61 was Rockstar Energy Husqvarna Factory Racing’s Thomas Covington. Covington’s struggle to feel comfortable at the opening round of the season in Patagonia Argentina and the past two weeks of training was unnoticeable in his riding today. Prado’s Red Bull KTM Factory Racing teammate, Pauls Jonass followed Covington as Covington’s Rockstar Energy Husqvarna Factory Racing teammate Thomas Kjer Olsen chased Jonass. 2017 MX2 podium finisher, Brent Van doninck who now rides for the Husqvarna 8biano Motorsports team put in a solid race for 5th place to position himself well for a repeat of last year’s performance. Back at the front a last lap error from Prado came up costly as tried to negotiate his way past lapped riders. Prado fell which let both Covington and Jonass get by before the finish allow Covington to score his first pole position of the new season. Honda 114 Motorsports’ Hunter Lawrence struggled to bring his Argentinian success into the European qualifying race as he shifted between 8th and 9th position before sneaking into 6th at the finish. Another rider who did well in Argentina but came up short during qualifying was BIKE IT DRT Kawasaki’s Darian Sanayei. Sanayei who led laps in Patagonia – Argentina will head the start in 16th tomorrow. MX2 Qualifying Race Top Ten: 1. Thomas Covington (USA, Husqvarna), 24:54.845; 2. 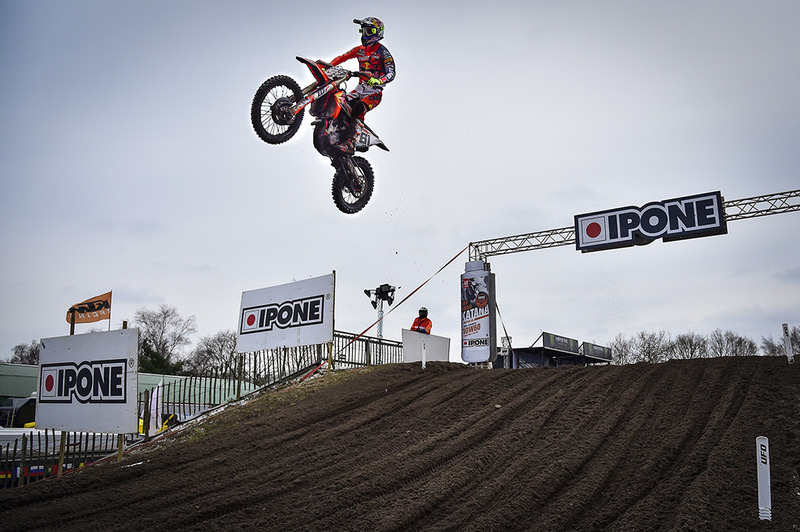 Pauls Jonass (LAT, KTM), +0:04.006; 3. Jorge Prado (ESP, KTM), +0:07.725; 4. Thomas Kjer Olsen (DEN, Husqvarna), +0:21.134; 5. Brent Van doninck (BEL, Husqvarna), +0:39.236; 6. Hunter Lawrence (AUS, Honda), +0:52.116; 7. Davy Pootjes (NED, KTM), +0:54.488; 8. Adam Sterry (GBR, Kawasaki), +0:55.994; 9. Alvin Östlund (SWE, Yamaha), +0:56.666; 10. Bas Vaessen (NED, Honda), +1:13.319.